My sojourn with Master Rushworth was but for a time. Accordingly some three days, or thereabouts, after that I had been a spectator of the lawyers’ great masque, I changed my abode to the house of one Mr Timothy Drake, a woollen draper, that dwelt upon London Bridge, on the north side. Master Drake was bound to my kinsman Master Harford, of whom I have before spoken, by many obligations of benefits received; and when the said uncle, being single and well advanced in years, was unwilling to be troubled with the charge of a child, Master Drake gladly received me; not, I suppose, without good consideration given. It was judged to be more convenient for me to lodge upon the bridge, which is but little more than a stone’s throw from the Merchant Taylors’ School, than in the Strand; nor was I unwilling to go, but my sojourn there was but for a very short time, as I shall presently show. 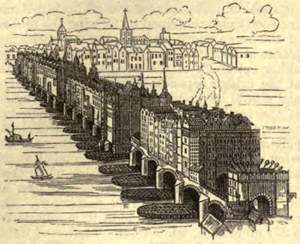 ‘Twas a marvellous place this same London Bridge, more like, indeed, to a village than a bridge, having on either side houses, some of them being shops, as was that in which I dwelt, and some taverns, and some private dwellings. And about the middle of the bridge stood a great building, which they called Nonesuch House, very splendidly painted with colours, and having wooden galleries hanging over the river, richly ornamented with carving and gilding. This Nonesuch House covered the whole breadth of the bridge from the one side to the other; and in the middle of it was an arch with the road passing under it. The bridge had, or, I should rather say, has (for it still stands and will, I doubt not, stand for many ages to come) twenty arches, of which one is blocked. They are but small, the purpose of the builder, Peter of Colechurch, having been, it is said, thus to restrain the ebbing of the tide, and so to make the river above the bridge more easily navigable. I should rather think, if I may say so much without wrong to the pious man, that in that rude age (now near upon five centuries since) he knew not how to build bigger. And being thus small they are still further diminished by the sterlings that are built about the piers, to keep them from damage by ice or floods. Thus it came to pass that of nine hundred feet (for such is the length of the bridge from end to end) scarce two hundred remain for the waterway. The consequence thereof is that when the water is lower than the sterlings it rushes through the arches with a singular great violence. How great it is may be judged from this, that in some of the arches there is a waterfall, so to speak, of as much as two feet, when the tide is at its strongest; and this strongest is when it is about half-spent, running upwards; but why the flow should be stronger than the ebb I know not, seeing that this latter is increased by the natural current of the river. I do remember, if I may delay those that shall read this chronicle with such childish recollections, how I marvelled at the first at this same ebb and flow, of which I had never before heard. On the first day of my coming to Master Drake’s house, being, as I remember, the seventh day of February, I looked out from my chamber window about half-past five of the clock, and saw the Thames full to his banks and flowing eastward, as by rights he should, it being then but just past the flood. But the next time that I chanced to cast my eyes on him, the tide having but newly begun to flow, lo! he was dwindled to half his span, and ran westward. Of a truth I thought that there was witchcraft, and, being a simple child, ran down into my host’s parlour, crying, “What ails the river that it is half-spent and runs the wrong way?” and was much laughed at for my pains. I thought to have much pleasure from sojourn in the house upon the bridge, and doubtless should have had but for the sad mishap of which I shall shortly speak. For indeed there was much to be seen daily upon the river. On the eastern side, looking, that is to say, towards the sea, there were goodly ships from all parts of the world, lading and unlading their cargoes, for through the bridge none could go; nay, the very wherries, for the violence of the water, would not venture the passage save at the highest or lowest of the tide; but passengers were discharged on the one side and took boat again on the other. And on the western side there were the barges of my Lord Mayor and of the richer of the Companies; and barges of trade, carrying all manner of goods and especially timber, both for building and burning; and small boats almost without number, both of private persons and of watermen that plied for hire. And on occasions there were races among the watermen and also among the ‘prentices of the City. And there were other sports, notably that of tilting upon the water, in which the vanquisher would dismount the vanquished, not indeed from his horse but from his boat, and sometimes drive him into the water, with no small laughter from the spectators. The bridge also afforded another pastime, for when the tide was so far ebbed that it was possible to stand upon the sterlings (which were at other times covered with water) there were many fishes to be caught, for these commonly resort where there is abundance of food to be found, as must needs be in so great a city as London. And if any cannot conceive of the anglers’ craft as practised in the midst of such din and tumult, they may take as a proof that the makers of anglers’ tackle congregate in Crooked Lane, which is hard by the bridge, more than in any other place in London. Being also a lad, for all my tender years, of an active fancy and apt to muse by myself, and to build castles in the air, or, as some say, in Spain, for my delight, I did not forget the story of Edward Osborne, that was ‘prentice to Sir William Hewet, clothworker, some time Lord Mayor of London, how he leapt from the window of one of the bridge houses, and saved his master’s daughter that had been dropped into the river by a careless maid. All the dwellers on the bridge have the story ready, so to speak, on the tip of their tongues, as if it were a credit to themselves; nor would I discourage the thought, for haply it might give a lad boldness to venture his life in the like gallant way. Hence, before I had been in the house an hour they showed me the window from which the said Edward leapt. All the world knows, I suppose, how he afterwards married this same daughter, and received with her a great estate, and how he rose to great prosperity, being Lord Mayor in the year 1583, and how his posterity are to this day persons of great worship and renown, who will yet, if I mistake not, rise higher in the state. ‘Tis true I was no ‘prentice, nor had Master Drake a daughter, save one that must have been forty years of age at the very least; but what are these hindrances to the fancy when it is minded to disport in its own realms? But now for the mishap which scattered these fancies and the hopes of other delights, of which I have before spoken. I came, as I have said, to sojourn with Master Drake on the seventh day of February, being, as I remember, a Thursday; and on the Monday following my sojourn was ended. Near to Master Drake’s house dwelt Mr John Briggs, a needle-maker by trade, who was wont to keep up a brisk fire for the carrying on of his craft. This being maintained at a greater height and for a longer time together than was customary, trade being beyond ordinary brisk, heated the woodwork adjoining, than which there is, as I conceive, no more common cause of such mischief. This at least, was conjectured at the time, for nothing could be known of a certainty. What is established is, that about ten of the clock at night on Monday aforesaid, the fire began in Mr. Briggs’ house, and that so suddenly and with such violence that he and his wife and child, a maid of about four years (who, as being of a more convenient age and size than Mistress Tabitha Drake, I had resolved should fall into the river and be saved by me) escaped with their lives very hardly, having nothing on but their shirts, and it may be said, the smoke, so near did they come to being burned. Nor were we in much better case, save that Master Drake and his wife and daughter, having entertained the parson of the parish to supper (’twas in the parish of St. Magnus the Martyr) had not yet gone to bed. Thus they were able not only to save themselves and me, who was in bed and sound asleep, more easily, but also to carry off some of their chief possessions. As for putting out of the fire, little or nothing could be done. A man might have thought that, the houses being on a bridge, there would be sufficient water at hand to prevent a fire, how great soever. But it was not so. By ill-luck it happened that the river was at its very lowest, so that the engines, of which there were three, newly made, and much admired for their excellence, could get no water from it, and, indeed, were broken in the endeavour. And when the conduits were opened, and the pipes that carried water through the streets cut, these also yielded but little water, so that the fire raged almost without let or hindrance. Yet such water as there was, was used to the uttermost, men carrying the buckets up ladders, which were set against the burning houses, and pouring them upon the flames. From this, indeed, came other damages, for the ladders were burnt through, to the hurt of many, by the breaking of their arms and legs, and even to the loss of their lives. All that night and the next day until noon the fire continued to burn fiercely; nor did it stop till it came to the first empty space upon the bridge; there it was stayed for want of matter, the brewers’ men that were on the other side of the river also helping by bringing abundance of water on their drays and wetting the houses that were yet unconsumed. There were forty-three houses burned in all, being about the third part of those that stood upon the bridge. The road was so blocked by the ruins that, though as many as had space to stand laboured to carry away the timber and bricks, and tiles and rubbish, none could pass over the bridge before Wednesday, and there were remains of the fire yet smouldering on the Tuesday following, as I learned to my cost, having on that day burnt my finger with a live coal of fire which I took up in my hand. By God’s mercy, the night was warm, or else the inhabitants that were ousted so suddenly from their homes had suffered much. It was still, also, a matter for which we are yet more bound to be thankful; for had the wind, which was, indeed, from the south, and so blew towards the City, been strong, London itself would have been much endangered, the more so as the traders in Thames Street have much pitch, tar, rosin, oil, and other inflammable goods in their houses. Indeed, were I minded to prophesy, I should say that some day, there will arise in this very part of London, for nowhere is the peril greater, such a conflagration as has never been seen in the world; save only, it may be, when Rome was set on fire by that mad Cæsar, Nero. As for myself, I found shelter, for the time, with my kinsman, Master Harford, in his fine mansion, hard by the Church of Saint Peter on Cornhill. Whether he would have kept me now that his scheme of lodging me with Master Drake had fallen through, I cannot say; but, if he ever entertained any such purpose, it was shortly dismissed by reason of my behaviour. ‘Twas, as I have said, a fine mansion, Master Harford being one of the wealthiest merchants in London, and the table kept proportionate thereto. There was no mistress of the house, Master Harford being, as I have said, a bachelor, but a housekeeper, Joan Fuller by name, a kind woman, and knowing in all the knowledge of the store-room and kitchen, but otherwise of scant sense. She, having none on whom to bestow her affections, save a cat and a dog, took a mighty favour to me, which favour she showed in the fashion that she herself would have most approved, if I may say so much without unkindness to the memory of one that is now deceased; for she plied me, both in season and out of season, with all manner of dainty meats, so that in the space of eight days or thereabouts I fell sick. ‘Twas no great matter, only a sickness as would come to any child that had been so dealt with, and was easily set right by the apothecary’s medicines, which, to my mind, so nauseous were they, did more than outweigh all the pleasure of my dainty feeding; but it settled Master Harford in his intention to lodge me elsewhere than in his own house. Master Drake could not entertain me any more, having to be content with scant lodging for himself and his wife and daughter. Nor was there any talk of building up the houses again; and this, indeed, was not done for more than thirteen years after the burning; but the sides of the bridge where they had been were covered in with boarding. So it came about that I was sent back to my first lodging with Master Rushworth, in the Strand. He was, as I have said, a merchant of timber, and had his house in the Strand, on the north side, with a yard on the other side of the street, in which he stored his goods and did his buying and selling. In this I was free to play as much as suited my liking, and here also I found great delights, of which the chief, I think, was the discovery that the captain of one of the barges which brought him timber was a certain William Beasley, of Oxford, who had served my father as bailiff and fisherman, and in other employments, as many as a single pair of his hands could discharge. With him I had much talk, and always counted this talk very precious, it being chiefly of home matters, so that only the actual going thither could by any means be more to be desired.